There are many different options when looking at prefabricated towers for sale. For smaller structures, the biggest benefit of buying a preassembled metal building is that once delivered, the building can be placed on top of the tower system. In the case of a guard shack on an observation tower, the prefabricated guard shack will be manufactured in our facility while the tower system is being assembled at the project location than when the tower system is complete, the guard shack will be crane lifted onto the observation tower and the project will be complete. 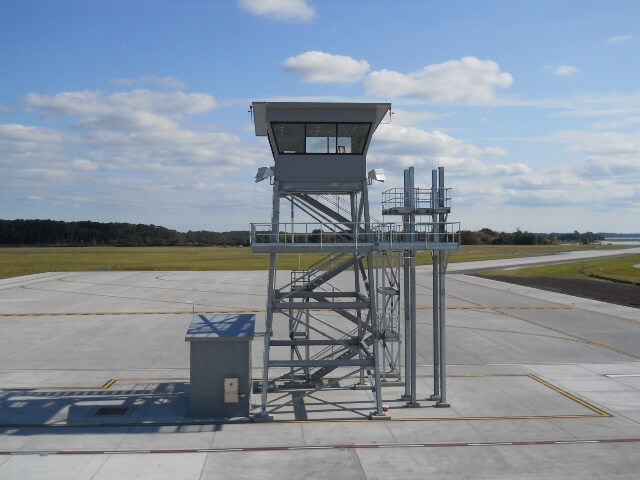 For a factory or office building or other company that has the need for a guard tower or shack, a prefabricated tower is the most cost-effective and easiest solution. Companies that have a lot of traffic going in and out often find the need for a guard shack to monitor the people entering and leaving the complex. A preassembled metal building is a perfect solution to a guard shack. With their sturdy construction, metal buildings offer a safe place with protection from the elements for employees to work while monitoring traffic. They are easily outfitted with electric and phone lines to keep in contact with the main office building and for light and other amenities. 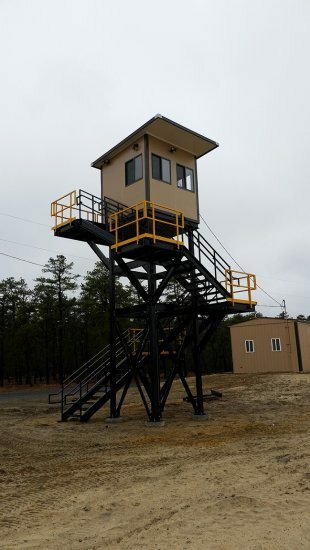 Often, for larger companies and those with expansive areas, a guard tower gives the security of being able to view a larger area of the property by having the guards in an elevated location. A prefabricated observation tower with exterior stairs is the way to go to have a bird’s eye view of a location. The towers are outfitted with steel steps. Much like a lifeguard tower, these observation towers for sale offer the height needed for an elevated view of an area but with the enclosed safety of a metal building. An elevated building with exterior stairs offers the benefit of usable space below the tower. This space is useful for storage. Elevated buildings also offer the option of enclosed space beneath the guard tower. This provides a more secure area for storage. The lower space can also be used for monitoring activity from a ground level view. See More of our Tower Systems! All guard towers for sale are corrosion resistant and built to withstand the elements. Enclosed towers will keep employees safe from all of the elements, including rain and wind; open towers offer a 360-degree view for correction facilities or training grounds. These open towers offer the same sturdy construction with the option of added height for a better view. To be used as a fire spotting tower, an enclosed elevated metal tower would be outfitted with a viewing deck around the entire enclosed space. The observation deck gives a 360 degree outside view and the enclosed area provides protection from the elements with windows on all sides for constant observation. As with all prefabricated tower systems, there are many standard building plans to choose from. Modular construction gives the end user the benefit of choosing from a standard set of plans and having a building delivered either ready for use or with minor assembly required. In the event that no standard plans meet the requirements of the customer, adjustments and redesigns are available to change the design to exactly what is needed. Options are available for the color and style of the exterior siding as well as the roof materials. The interior walls have options as well for color and accessories. Another benefit of preassembled metal guard shacks is their ease of expansion. When and if the need arises to change the size or use of the shack, these preassembled metal buildings are built to be easily expanded. The exterior wall system is designed for expansion. 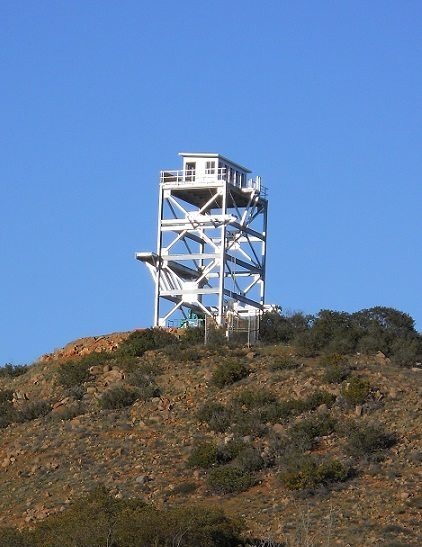 For use in all types of weather and climates, the observation towers for sale are easily outfitted with heating and cooling systems as well as electrical and phone lines. The exteriors are corrosion resistant and offer insulation options. Metal stairs and railings are durable and resistant to wear from weather and use. 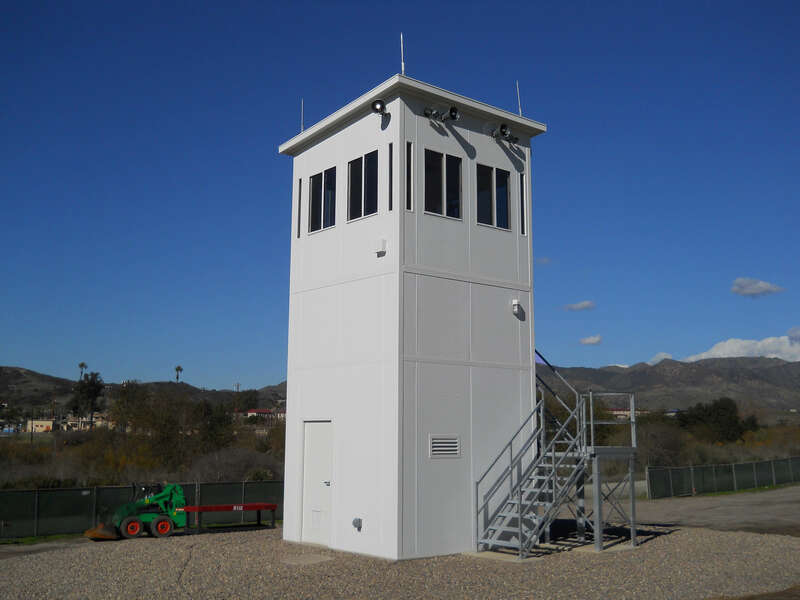 For use in training facilities, a ballistic proof tower is an option. Guard shacks and towers are easily relocated and are outfitted with a forklift welded structural steel base. This means that they are able to be moved with the use of a forklift; even elevated towers are easily removed from their bases to be relocated. The towers and shacks are built to building codes and standards. They are assembled to be able to be moved without causing any damage to the integrity of the building.